February 2, 2012 - In late 1861, Virginia residents were shocked to see a manned balloon rise on the horizon, directing Union Army artillery against Confederate positions. One hundred and fifty years later, the Intrepid the first type of aerial vehicle used for combat in the United States will take flight once again beginning this summer. Genesee Country Village & Museum one of the country's preeminent living history attractions, has begun building the world's only Civil War manned balloon replica, with the intent of offering flights to visitors starting July 4. Rising 400 feet (32 stories) above the 700-acre museum grounds near Rochester, N.Y., the Intrepid will carry up to four passengers at a time in addition to the pilot. "Our launch of the Intrepid brings to life one of the most unique elements of American history in a manner never before attempted," said Peter Arnold, chief executive officer and president of GVC&M. "As Civil War remembrances occur across the nation during its 150th anniversary, we believed there was no better time to undertake this initiative. The balloon and the planned Civil War encampment surrounding the launch site further enhance our authentic 19th century village the third largest collection of historic buildings in America." Not only was the Intrepid the predecessor to modern-day military aviation, but it also foreshadowed the future of military reconnaissance communications. The pilot would send intelligence information troop movements, artillery compensation instructions, and more -- to soldiers on the ground via telegraph. Conceived by Professor Thaddeus Lowe, the resulting Union Army Balloon Corps was personally approved by President Abraham Lincoln in June 1861. "I commend the Genesee Country Village & Museum for taking a lead to insure that the role of the Aeronautic Corps in the Civil War is fully appreciated," said Tom D. Crouch, Ph.D., senior curator of Aeronautics for the Smithsonian Institution's National Air and Space Museum. "I am certain that your efforts will result in one of the most memorable activities of the 150th anniversary of the conflict." Dr. Crouch has chosen to serve as an advisor for the project. 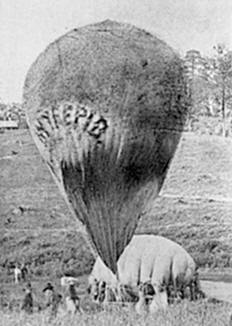 The Intrepid was a hydrogen gas balloon or aerostat built for use by the Union Army Balloon Corps for aerial reconnaissance purposes during the American Civil War. It was one of seven balloons constructed for the Balloon Corps and was one of the four larger balloons designed to make ascensions to higher elevations with a larger lift capacity for telegraph equipment and an operator. It was the balloon of choice for Chief Aeronaut Thaddeus Lowe overlooking the Battle of Fair Oaks. The fateful flight over the Battle of Fair Oaks was instrumental in saving the fragmented army of Union Army General Samuel P. Heintzelman from what would have been sure defeat at the hands of the Confederates. The Intrepid undergoing a lengthy inflation was quickly hooked up to the spout of the smaller Constitution by means of a de-bottomed camp kettle by which the gas was transferred in shorter time to make the ascent. Visitors will have the opportunity to book 15-minute flights for a nominal cost in addition to their museum entry fee. More details will be released over the course of the coming months. The Intrepid is being built by AeroBalloon Inc. of Hingham, Mass., with historical guidance from GCV&M, Dr. Crouch, and a team of prominent advisors including Jim Green, director, Planetary Science Division, National Aeronautics and Space Administration, and Rob Shenk, director, Internet Strategy & Development, Civil War Trust. The initiative's total estimated cost of nearly $300,000 has been partially offset by a number of generous donations. As construction progresses, GCV&M will continue to seek additional financial support for the project.